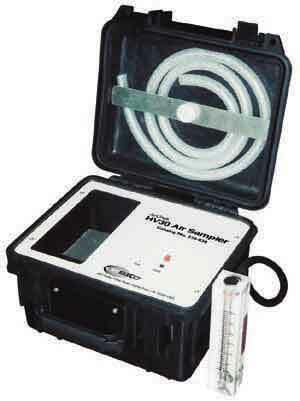 SKC, Inc. HV30 environmental air sample pump is a high volume constant flow pump that provides flows from 10 to 30 L/min with automatic flow correction for increases in back pressure. The system can be used for the collection of particulates, polynuclear aromatic hydrocarbons (PAHs), bioaerosol sampling, stack sampling, indoor air studies, fenceline monitoring, and background monitoring. Housed in a heavy-duty, weather-resistant case for use in rugged environments, the unit is designed to be quiet for indoor applications and can be line-operated or run from an external battery.